Wooden spoons have been around ... oh, since sticks were invented, probably. 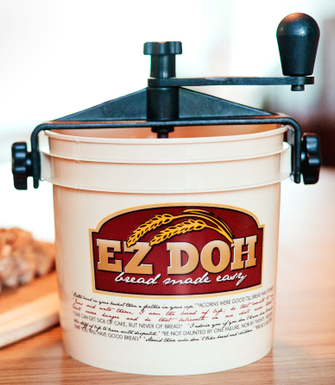 How many other kitchen tools do you use that have changed so little since your grandmother's time? Sure, you can find them made from bamboo or fancy wood. You can find them with holes in them, or made into unique shapes. 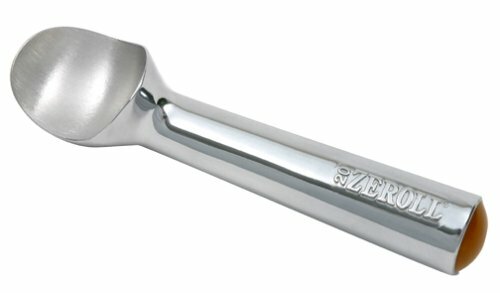 But still, they're pretty much the same spoons. My favorite wooden spoon is a unique shape, but it didn't start out that way. Years of pot-stirring changed its shape. It has lasted longer than many tools that were more expensive, and since then I've acquired even more wooden spoons. It's an unusual day in the kitchen when I don't use a wooden spoon to stir something. When you make focaccia, you need to dimple the surface just before baking. If you don't want to get your fingers all greasy again, just use the handle of a wooden spoon to do the poking. And, bonus! It's kind of fun to randomly stab the dough. There are probably times when you want to leave the lid of a pot slightly open during cooking, but trying to position a lid just-so on a pot isn't always easy. A wooden spoon in the pot or laid crosswise on the rim can serve to keep the lid vented. 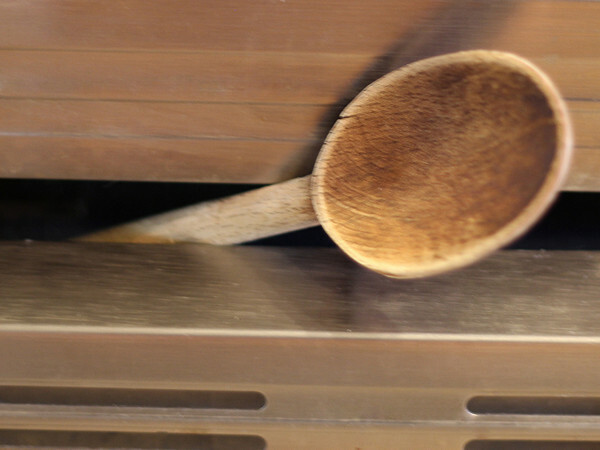 The great thing about using a wooden spoon is that it won't get hot, if you need to move it. If you like making decorative foodstuffs, a wooden spoon can come in handy for shaping things. For example, parmesan crisps. You can roll them around the handle for a tube, drape them over the handle for taco-shaped crisps, or lay them on the spoon for gently curved bowls. Other foods that start off soft and pliable - like ice cream cone shells, pizzelles, or krumkake - can be draped over a wooden spoon handle to create a fillable taco-like shape. There's an old joke - when is a door not a door? When it's ajar. Sometimes you need to leave your oven door slightly ajar for a recipe, but if you're moving around in the kitchen, there's always a chance you'll bump the door and close it accidentally. A wooden spoon stuck in the door will keep it open. If you're boiling something that's likely to foam up, a wooden spoon laid across the top of the pot will thwart the bubbles and help keep it from foaming over. It's not foolproof - a vigorously boiling pot can still boil over. But a simmering foamy concoction will be much safer with that spoon on top. The tricky part is finding some place to suspend those spoons. If you've got tall stockpots, you can hang them there. Or between a pile of books. Or ... I'm sure you can think of something. Did you know that you can use a wooden spoon to tell if your oil is hot enough? And it works with small amounts of oil. Just dunk the spoon handle into the oil, and if you see bubbles, the oil is hot enough. At first, you'll see larger, slower bubbles, but as the oil gets hotter, there will be smaller, faster bubbles - about the same bubbling action you'd see when you put food in the pan. 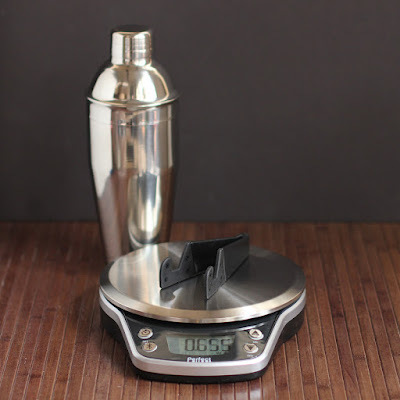 The nice thing about this method is that it works even when you've got a small amount of oil that would make it difficult to measure with a thermometer. And, until the "toss a drop of water in the oil" method, you won't have the crazy spattering. While my favorite wooden spoons are my older ones, there comes a time when they might be too old for cooking - but that doesn't mean you can't find something else to do with them. A wooden spoon can be used as a plant stake or garden marker - you can write on the spoon or the handle, so you know which peppers are the really hot ones. So, what do you use your spoon for that other might not know about? 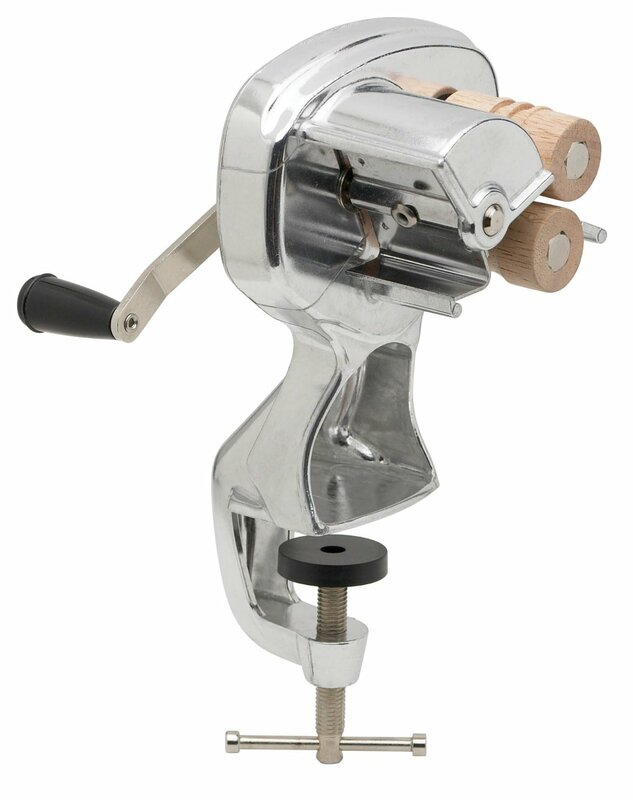 Making home made pasta is fun, but if you want to move beyond flat ribbons, you might need a few bits of equipment to make the job easier. Fante's Cousin Elisa's Cavatelli Maker from Harold Import Company ($32.37) is my latest in the arsenal of too many pasta gadgets, and it's kind of fun to use. Once the pasta dough is made, you cut it into ribbons, feed it into the cavatelli maker, and crank out the cavatelli. It's not quite as easy as that, though, through no fault of the machine. For the cavatelli maker to churn out cavatelli shaped pasta, the dough has to be the right consistency, the ribbons need to be the right width and thickness, and the cranking speed needs to be right. If the dough is too soft, it will stick in the cavatelli maker, no matter how much you flour the outside. If the dough is too dense, it won't curl as well into the proper shape. When it comes to making the ribbons, I eyeballed the first batch and had mediocre results. I measured the second batch and found out that my eyeballed ribbons were way too wide and not nearly thick enough. Later batches worked much better. You can find the recipe I made here. After some kneading to get it smooth, I rolled the dough to about 3/8-inch thick and then I cut it into strips about 3/4 inch wide. Because of the gluten in the dough, it tended to shrink width-wise while getting a little thicker. So, you can cut to those dimensions and flatten the ribbons a bit before feeding them through the cavatelli maker, or roll about 1/4 inch thick and cut them slightly wider. The optimum width is 1/2 to 3/4 inches, so having them shrink a little is fine - but I wanted my cavatelli to be larger rather than smaller. I found that cranking quickly worked best when I first fed the dough through the cavatelli maker, but when I re-rolled the scraps and the dough had more flour incorporated into it, I needed to crank just a little bit slower to get the correct shapes. It's easy enough to look at the results and adjust the speed. While it's fun to pile them up and watch the mountain of pasta grow, it's best if you keep them dusted with flour and as separate as possible, unless you want the fun of trying to separate stuck pasta, or starting over with re-rolling them. For every dough ribbon I fed through the cavatelli maker, I had a few that didn't shape correctly, usually at the beginning or end of the ribbon, but since I wasn't making them for professional sale, it didn't matter that I had a few that were flat or odd-looking. If you're after perfect presentation, you can pick out the mutants and add them to the pasta scraps that remained from cutting the ribbons and give them another run through the cavatelli maker. 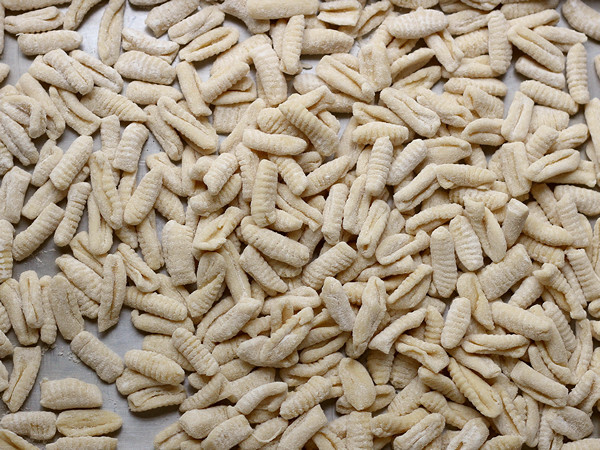 The cavatelli can be cooked immediately, or you can let them dry a bit before cooking, or freeze them for later use. If you're not going to be cooking them right away, dust them with flour. If you can spread them out on a baking sheet, that's best - it keeps them from sticking together. Give them a little shake now and then to make sure that they're not gluing themselves together where they're touching. Cook the finished cavatelli just like any other pasta - in boiling salted water until they're done to your liking. Fresh pasta cooks faster than dry, but keep in mind that these are thicker than your basic spaghetti or linguine. It's best if you don't add the cavatelli to the water in one big pile - send them into the water gently, or you could end up with one large clump of stuck pasta. They're less likely to stick if they're frozen or if you've set them out to dry a bit, but its still best to add them slowly. Then stir. And stir again later. Fresh pasta is sticky, and you don't want it sticking to the bottom of the pot, either. And there you have it. Home made pasta, all ready for sauce. Or, if you prefer, cook them in boiling water, then toss them in a pan with some brown butter. Maybe with some sage or thyme. Who's it for: People who often make home made pasta and want to make specialty shapes. Pros: So far, it seems to be sturdy and well-made. I was happy with the pasta I made with it, and it was really fast. Cons: There's a bit of a learning curve, particularly if someone hasn't made pasta dough before. Also, like many pasta makers, this can't be washed in water, so if that squicks you out, you might want to stick with buying boxed pasta. Source: I received this at no cost from Harold Import Company. Want more info? Check here. 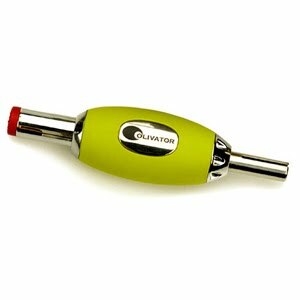 The very first review on Cookistry was a product called the Olivator that I reviewed in January, 2010. Wow, that was a long danged time ago. The Olivator, made by RSVP, is designed for stuffing semi-hard food items into other tasty food items. I used it to stuff Milky Way candy bar pieces into strawberries, and a spicy goat cheese mixture into cherries. Funny story about those cherries. Back then I was getting very little traffic on my blog, so tracking visitors was a bit of an obsession. For some reason, I got a visit from the White House - the one in Washington - on that post. While I wish that the White House Chef was checking out my site for recipes, it was probably an automated visit from a security-based computer because of the name of the recipe. I called them Cherry Bombs. Oopsie. So, after four years, I still use the Olivator on occasion, mostly for holidays when I want to make a fancy appetizer. I've also used it to cut out melon pieces and stuff those cores into melons of different colors. When I first reviewed this, some fold said that you could do the same thing with a pastry bag. Not really. You can pipe soft products with a pastry bag. This doesn't work well at all with soft products. But it excels at stuffing semi-hard substances that you could never pipe. While it's not an essential piece of hardware, is performs a unique function that I use once in a while. Who's it for: People who do a lot of fancy presentation, Martha Stewart clones, food bloggers, and other crafty folks. Pros: Does what it's supposed to do very well. Well-built and solid. Comes apart for cleaning. Cons: Most people probably don't need something like this, and for occasional use, it might be a tad pricey. 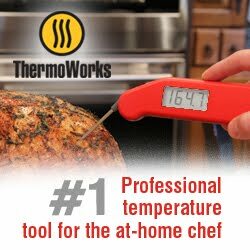 Source: I received this at no cost from a kitchen store in order to do a demo at their site.